Next month, healthcare and social support for seniors will come under one roof, as the Ministry of Social and Family Development hands these services over to MOH. Read more on the advantages and pitfalls. When it comes to the elderly, medical and social needs often go hand in hand. Ms Nancy Tan, a volunteer befriender, can attest to this. One of the seniors she visits regularly is visually impaired and has incontinence. The impact of these health problems is magnified because the man lives alone. “He doesn’t like to shower because he can’t see,” said Ms Tan, who volunteers with NTUC Health’s Community Befriending Programme. In a month’s time, healthcare and social support for seniors will come under one roof, as the Ministry of Social and Family Development (MSF) hands these services over to the Ministry of Health (MOH). Senior activity centres, befriending and counselling services, as well as a helpline for seniors, will all change hands. Only senior group homes and sheltered homes will remain under the MSF. Announcing the move during his Budget speech last week, Finance Minister Heng Swee Keat said social and healthcare needs are “closely inter-related and both have an impact on the well-being of our seniors”. These changes will allow eldercare services to be “planned and delivered holistically”, he added. The Government has assured seniors that existing care arrangements will carry on as usual after the handover. But the benefits of having a central agency able to manage the sector in its entirety cannot be underestimated. At present, eldercare is a complex arena in which different players report to different ministries and often meet overlapping needs. Bringing together health and social support makes sense – not just to avoid duplication, but to simplify things, share information between care providers and so provide more well-rounded care. Even then, those in the health and social care fields say that while there are many advantages to the consolidation, there are also pitfalls to be wary of. Like Ms Tan, those in the eldercare industry know at first hand that physical problems can have a significant impact on mental health, and vice versa. 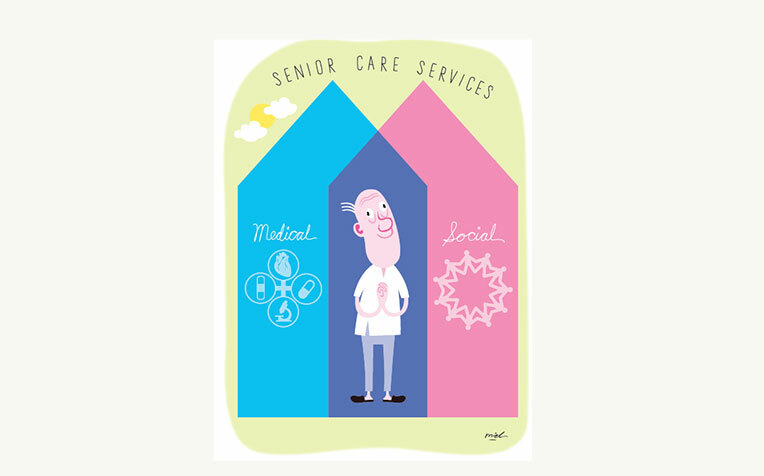 But at the moment, many seniors’ social and healthcare needs are being met separately by a complex and diverse array of community organisations. Take 78-year-old Mr Kee Kuang Yoh, the main caregiver to his wife – a wheelchair user – and who yet has health issues of his own. In recent years, the retired construction worker has been helped by Pioneer Generation Ambassadors, befrienders, representatives from the Community Networks for Seniors and staff from a nearby family service centre. As well, it is not uncommon for hospitals, religious groups, voluntary welfare organisations (VWOs) and even university students to be involved in caring for the vulnerable elderly. In many ways, all these helping hands play a role in stopping the vulnerable elderly from falling through the gaps. But having just one agency in charge could help streamline these efforts. Ms Peh Kim Choo, chief executive of the Tsao Foundation, a non-profit group that specialises in ageing issues, observed of the current situation: “Generally, we want more specialist services and targeted schemes to better serve diverse needs. One change could be to cut down on duplication in the sector. For example, Dr Loke Wai Chiong pointed out that some hospitals and VWOs have started to include community nurses in their teams to prevent unnecessary re-admissions – even though dedicated home nursing organisations already exist. “Duplication in this respect can lead to higher costs of community-based care,” said Dr Loke, who is the healthcare sector leader for consulting firm Deloitte South-east Asia. With better coordination, an elderly patient could perhaps move seamlessly between hospital and home-care teams – negating the need for hospital nurses to make additional trips to a patient’s home. “In this case, it may be true that resources could be used more efficiently. This could be done by rationalising and reorganising both manpower plans and funding models,” Dr Loke said. But he also warned against the “over-medicalisation” of social care that could happen after both medical and social needs come under MOH’s purview. He explained that some people may need extra social support – rather than more healthcare visits or medicine – to lead an active life and stay plugged into the community. “If not budgeted appropriately, Singapore might end up applying the expensive and inappropriate solution, which eventually leads to even higher costs,” he said. By 2030, the ranks of older Singaporeans aged 65 and above will swell to more than 900,000 and account for a quarter of the citizen population. Nearly one in 10 will be living alone or with a similarly aged spouse – and a key issue will be that of preventing this group from becoming socially isolated. But to keep people plugged into the wider community, policymakers should keep in mind that these things are not a case of one-size-fits-all. For example, senior activity centres are designed as hubs where low-income and vulnerable seniors can come together to form social support networks. It is not uncommon for Mandopop tunes to be playing on karaoke systems there, or for group activity instructions to be given in Mandarin. To some extent, this is only practical as many older seniors do not speak English. However, it also means that those who do not speak Mandarin may feel unwelcome and be less inclined to join in. In a study, Associate Professor Angelique Chan found that people from minority ethnic groups are less likely to use such centres. The issue needs to be addressed if no Singaporean is to feel left out. That being said, there are no easy answers. “Perhaps you could engage them in activities that aren’t reliant on one particular culture, such as exercising or gardening,” Prof Chan suggested. While efforts to keep seniors from being socially isolated have traditionally focused on lower-income groups, they are not the only ones who may need help. In a local study of 5,000 seniors, Prof Chan found that paradoxically, seniors who lived with their children were the loneliest of all. In many cases, seniors are left home alone or with a domestic helper during the day after their adult children go out to work. “What tends to happen is that all their physical needs are met, but they are not interacting with people,” she said. This is not just a psychological problem. Loneliness can weaken a person’s immune system and raise his blood pressure. A review of 23 studies even found that being lonely could increase a person’s risk of heart attacks and strokes to the same extent as smoking or obesity. Problems like these lie squarely at the intersection between health and social support. Perhaps the solution lies in a specialised counselling service for people aged 50 and above, as well as a telephone counselling helpline, both of which MOH will be inheriting. Moving social care services under the MOH wing sends the strong signal that these issues must be dealt with as a package. But sorting out the fine details will take time.